Without diagnostic monitoring and management, feral populations place homed cats at risk of infection with FIV and FeLV, infestation with external parasites such as fleas and mites, and internal invaders including bacteria, viruses and intestinal or respiratory worms. Cat welfare charity, Cats Protection, is promoting the UK’s first major census of Britain’s stray and feral cat population. Cat Watch isn’t just a counting exercise; it’s a serious attempt to monitor the health of an estimated 1 million homeless and abandoned cats living on Britain’s city streets. 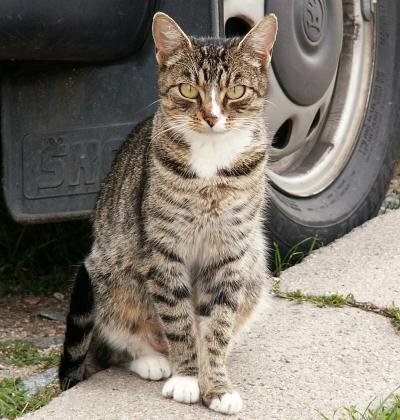 The shared social nature of homed pet and homeless strays makes total separation of the parallel populations practically impossible, underlining the need to know and understand the risk that feral felines pose to Britain’s 7 million pet cats. The Cat Watch project, tested on the streets of Nottingham, Bradford, Luton, and the Everton district of Liverpool, and supported a wide spectrum of organisations including the Liverpool University Veterinary Practice, will give a clearer view of UK feral cat health and include a neutering and welfare programme. Cities such as Rome, Paris and Liege are famous for their more or less successful attempts to manage the health and numbers of their feral cats. The 2010 Liege project provided important data on the risk of pet cats to strays infected with Feline Immunodeficiency Virus (FIV) and Feline Leukaemia Virus (FeLV), while an earlier trap-neuter-release project in Rome was undermined by the uncontrolled breeding and abandonment of homed cats. Veterinary diagnostic testing kits for such as Giardia, Cryptosporidium, Rotavirus, Chlamydiosis as well as a combined diagnostic for FIV/FeLV provide the early detection essential to effective treatment and containment of disease in managed cat environments such as breeding centres and catteries. Veterinary laboratory tests also provide detection systems for external parasites including. The same tests provide an efficient resource for monitoring the health of feral and stray populations. Pet animal welfare charity BlueCross advises that most apparently stray cats do in fact have a home. Before any cat wandering into your home or garden is treated as a genuine stray, BlueCross suggest a few simple actions toward uniting the wanderer with their true owner. Talking to neighbours is a good start. Posters, press ads and local social ads will also spread the message. Attaching a paper collar to the cat with your contact details gives the cat’s owner an opportunity to confirm ownership. Pet charity, the PDSA, estimates that three in five owned cats are now microchipped. So a quick microchip scan at your local veterinary surgery or pet charity re-homing centre might well identify a cat’s owner, even the cat has travelled some considerable distance.